This Juice and Smoothie Booster is an energising combination of powdered plant foods and sprouted hemp protein to give you a nutritious boost and protein source to fuel you throughout your day. Perfect before a workout or for a Friday night pick me up after a long week at work. This Juice and Smoothie Booster Powder is made from organic maca powder, organic sprouted hemp protein powder, organic moringa powder and organic cordyceps powder. Primrose’s Kitchen makes healthy food following the naturopathic principles in the heart of Dorset. Primrose felt real healthy food shouldn’t sacrifice on flavour, so she set out to bring a range of gluten free, vegan products to the market to help people enjoy eating healthily. Maca powder, sprouted hemp protein powder, moringa powder, cordyceps powder. 1 teaspoon 1-3 times daily in 300ml of a juice or smoothie. This mix has not been tested for its safety for children, during pregnancy or breast feeding. Therefore, it is recommended you seek prior approval from a medical practitioner or herbalist before use. Packed in a facility that handles nuts and sesame seeds. May contain traces. 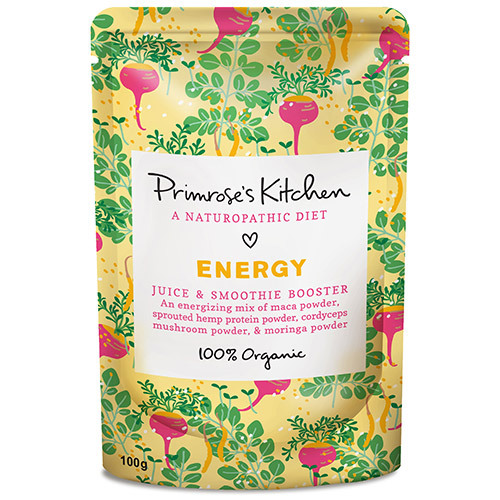 Below are reviews of Primrose`s Kitchen Organic Energy Juice and Smoothie Booster - 100g - Best before date is 31st May 2019 by bodykind customers. If you have tried this product we'd love to hear what you think so please leave a review.